Wetness protection gaiters MT-Plus, steel cable, fishing, hiking, paintball tactical, rain forest, marshland hunting, moisture-protection gaiters, black by CamoOutdoor at Kerinci. MPN: 83. Hurry! Limited time offer. Offer valid only while supplies last. 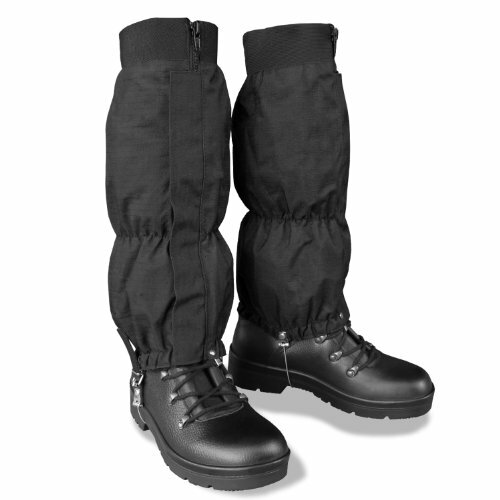 Pair of waterproof gaiters in Black. These gaiters are made from a tough Rip Stop material, and give your trousers protection from water and mud. Pair of waterproof gaiters in Black. These gaiters are made from a tough Rip Stop material, and give your trousers protection from water and mud. They are elasticated at the top and bottom, and have a full front zip for getting them off and on easily. The zip is covered by a Velcro storm flap, and they have leather and steel cord straps to secure around your boots. They measure 15 inches in length, and their elasticated nature makes them one size fits most. Waterproof, Rip Stop gaiters; ideal for hiking trips. If you have any questions about this product by CamoOutdoor, contact us by completing and submitting the form below. If you are looking for a specif part number, please include it with your message.